I’m never taking this patch off ..
.. I will wear it until it wears out. I’m a one-day rider of the 2011 Seattle to Portland Bicycle Classic. Granted, it took me nearly the whole day (17.5 hours) to complete, but I finished. All 206.44 miles of it (should have been 202, but ..
.. I got lost trying to find the finish line in Portland). 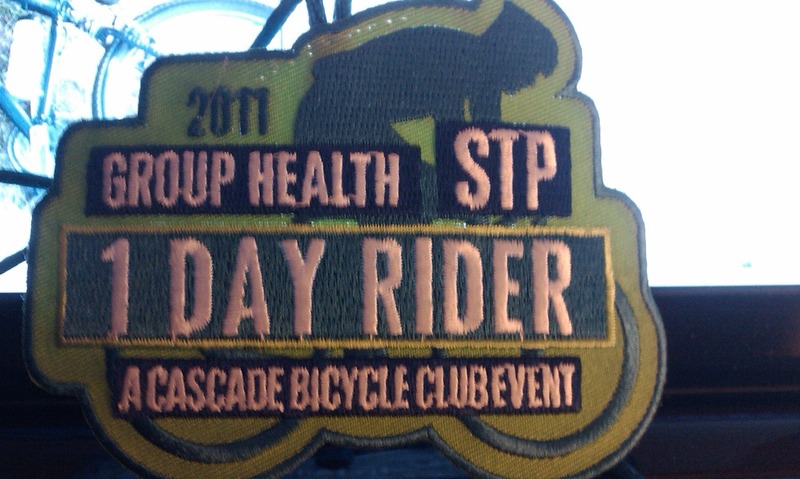 I should have paid better attention to the STP 2011 Route Map (it was quite dark by then). Endomondo captured my STP 2011 Ride on my Android device. I was using low-power mode to ensure the battery would make the trip. As a result, some of the GPS is a bit choppy. The weather was perfect; deliciously cool in the morning and 72 degrees all afternoon. Cascade Bicycle Club support .. thanks to the many volunteers was astounding. The riders were amazing; everyone played nice, collaborating and teaming to make the ride a joy for all. Special thanks to my 24 Hour Fitness trainer, Dana for the stretching advice and new (and painful) core workout. I am sure it contributed to my endurance and stamina. 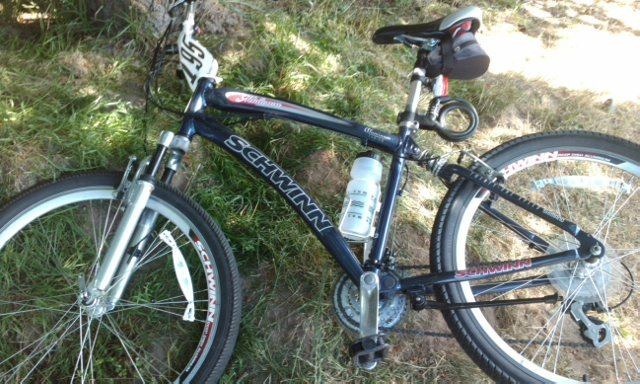 I rode The Beast .. a 2008 Schwinn Midtown ..
“Not many can say they did STP in one day on a mountain bike!” Note: I cannot say this either; The Beast is a hybrid. It has large, but non-knobby wheels and a significantly lighter (and flimsier) frame than a mountain bike. Thanks to all for their compliments .. which they gave right before they passed me. I kept up well enough though, averaging 11.8 miles per hour for the duration (including stops). An amazing experience, overall. 1540: Vader. 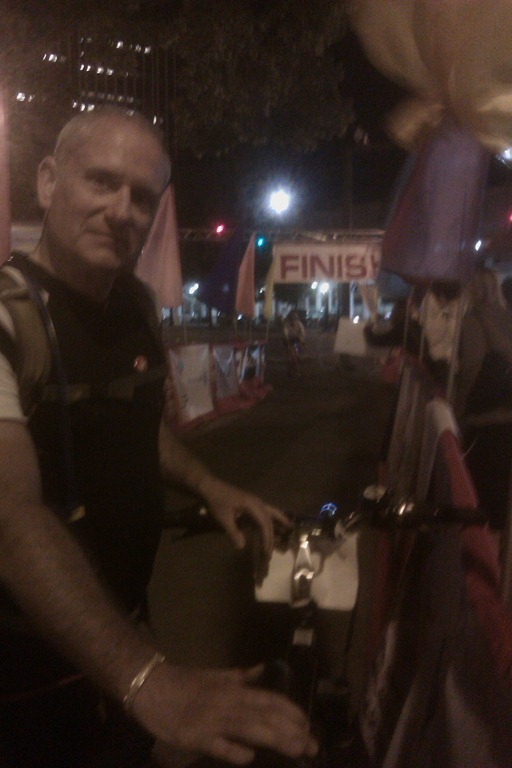 #BikeSTP #fb location: http://bit.ly/qODG0V (heh .. GPS shows me at 0.000, 0.000; zoom out for the fun). 1929: Deer i island. #BikeSTP #fb location: http://bit.ly/p1ADhN (I didn’t see any island, btw). It was a very good (and long) day. Considering I am such a fair-weather biker .. and as this year has been the wettest on record, I did very little training. Endomondo tells part of the tale .. Google Maps tells the rest. Will I do it in one day again? While on the ride, I was pretty convinced that I would not. After all, I had proven it to myself. Next year, I think I’ll do it in two days, seeking shelter in Chehalis on Saturday night .. enjoying a beer, some barbeque and a hot tub. Of course, something might change .. I might replace The Beast with a more STP-worthy ride .. and then I’ll need to prove it to myself again. Happy with me, she was not. Back on the daily pill. She’s happy with me again. I’m putting up a series of “My Daily Regimen” posts about my workout, weight, diet and vitamin intake. You can find all of them in the “Weights and Measures” section of my blog for future reference. Bluebonnet Age-Less Skin Formula (DMAE, alpha lipoic acid and vitamin C ester) for skin and vitamin C supplement. Now Foods Omega-3 (fish oil) for reducing risk of coronary heart / cardiovascular disease. Nature Made Triple Flex (glucosamine, chondroitin and MSM) for joint comfort, mobility and flexibility. Nature’s Way CLA-1300 to reduce body fat and improve muscle tone. I’ve not done a detailed nutritional analysis of my vitamin intake, but as I maintain a healthy diet, I think these supplements have me covered. Anyone with the desire to do such an analysis, please feel free to share the results. This collective regimen along with diet has enabled me to lose 60 pounds over the past five years, keeping it off and changing my body type from ‘a little extra padding’ to ‘athletic’. I just got an attaboy from my doctor for my labs during my annual checkup. Last September, I posted "By the Numbers". My doctor was kind enough to tell me "your numbers are good for a teenager". Maybe this comes from hanging out with the guys from MySpace? I’ll have Cholesterol, C-rat and PSA tomorrow; I didn’t fast prior to the blood, so they may be slightly skewed. I’ll post the actual numbers when I get them. It has been six months since my last blood work. Happily, my IQ is still higher than my cholesterol level; no: I’m not dumber; the cholesterol is down two points from the last time: “IQ and Cholesterol Level”. Specifically, mine. My blood work came back today and my cholesterol level is lower than my IQ.